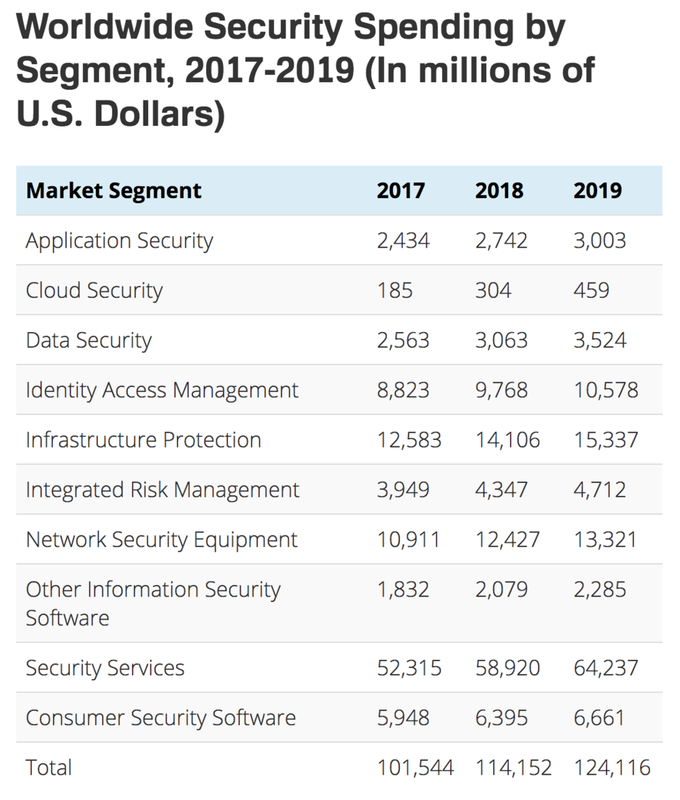 Worldwide spending on information security products and services will reach over US$114 billion in 2018, an increase of 12.4 percent from last year, according to recent forecasts from Gartner, a market researcher. The firm has identified key trends affecting information security spending in 2018-2019, including 30 percent of organizations spending on consulting and implementation services related to the European Union’s (EU) Global Data Protection Regulation (GDPR) through 2019, along with risk management and privacy concerns within digital transformation initiatives driving additional security service spending through 2020 for more than 40 percent of organizations. Findings estimated that revenue for the information security market would grow at a compound annual growth rate (CAGR) of 7.8 percent from 2017 through 2022 and reach US$143 billion. Within this, the security testing segment would record the fastest growth, at a CAGR of more than 14 percent according to the same analysis. As a percentage, the level of spending on security services forecast by Gartner will account for 51.75 percent of the total global security spending by segment in 2019, at US$64.237 billion out of US$124.116 billion overall. If the estimates are correct the percentage change between 2017 and 2019 for the segment will equate to 22.79 percent and account to almost a US$12 billion gain over this forecast period. Gartner said it believes that privacy concerns will “drive at least 10 percent of market demand” for security services through 2019 and impact a variety of segments, such as identity and access management, identity governance and administration and data loss prevention. Security is a key factor in the uptake of that transformation process for regulated data, critical operations and intellectual property protection spanning public cloud, SaaS (Software-as-a-Software) and the use of Internet of Things (IoT) devices. A large portion of respondents to Gartner’s security buying behavior survey therefore indicated that they plan to deploy specific security technologies, such as security information and event management (SIEM), in a hybrid deployment model in the next two years. Managed services represented roughly 24 percent of deployments, on average. The firm’s research found that on-premises deployments are still the most popular, but cloud-delivered security is becoming the preferred delivery model for a number of technologies. Older PostIBM Security - Data Breaches. The threat is real.